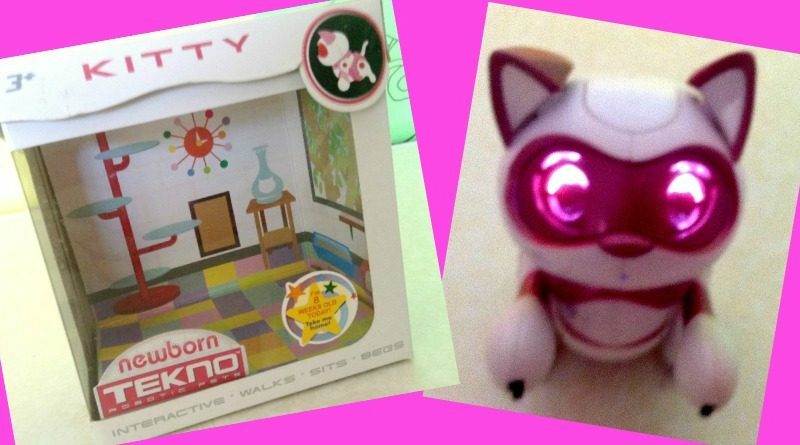 My daughter seems to be fascinated by electronic pets like the Tekno Newborn Kitty. We got this one, though she wanted the larger one. She gets all these electronic pets and then once she opens them and plays for one day, she forgets about them. She also has a tendency to forget about her live pet, I need to keep reminding her that she needs food and water. Perhaps it is usual for an 8 year old, but when should one put a stop to the number of electronic pets. Well, I guess it is fun to have nice toys around, and I wish I had them when I was growing up. The variety of toys nowadays cannot be compared to when we were children. I love reviewing these electronic toys as there is so much to tell about them. This electronic Kitty Toy, is not the same, but it is fun, but really it could have been better. The only reason I am reviewing it, is because we already bought the product. Perhaps the Bigger Tekno cat or puppy are better. But this one was okay. I would not say it is appropriate for an 8 year old girl. I mean she will definitely be excited to get one, and there is nothing wrong, except that she may use it once and leave it. My daughter desperately wanted it, but then after a week she forgot about it. The manufacturer suggests this toy for a 3 year old. Though the quality is not great and ears can come off . So the child needs to handle it with care. One ear came off in ours but we could put it back. 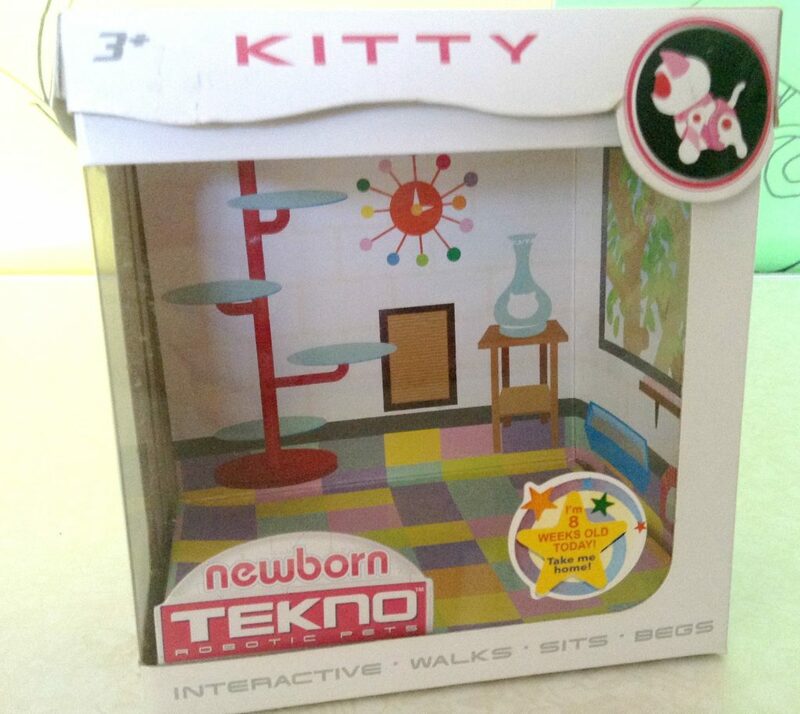 What is the Tekno Newborn Kitty? 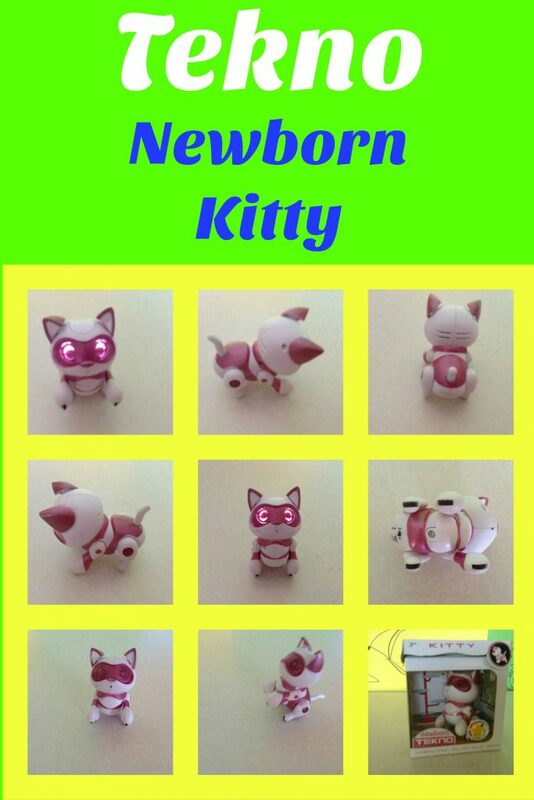 The Tekno Newborn Kitty is one of the interactive Kitty toys in the market. You also get the puppy version and the adult version which does more things and comes with a different app. 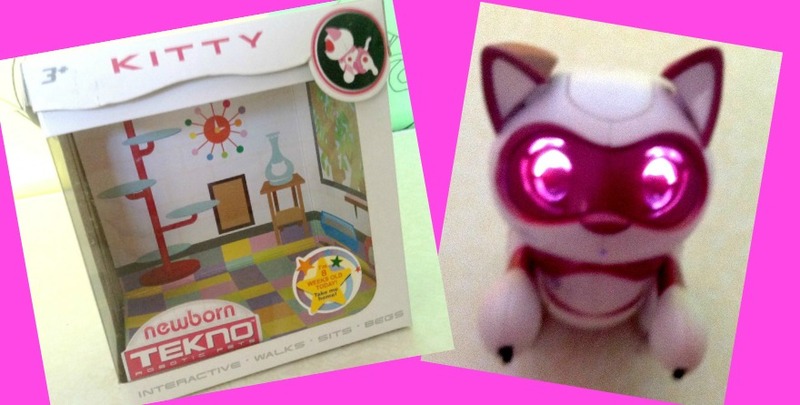 The Tekno Newborn Kitty also comes with an app, and I will be discussing that. It is more, I would suggest that to have real fun you need to download the app. Except that there is a problem. 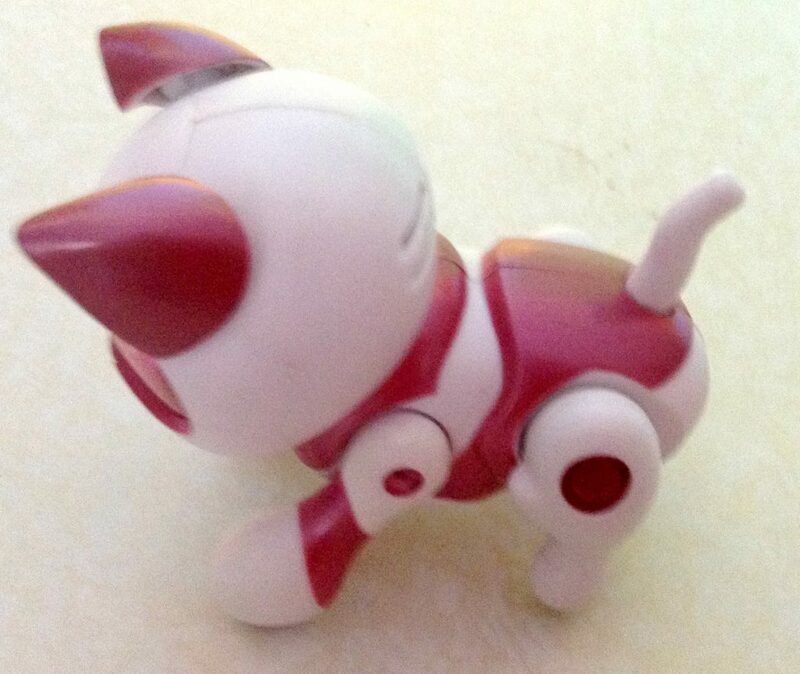 We could not really get the app to interact with this electronic cat toy. I tried and tried. I even recharged my batteries thinking it was the batteries. But no. Maybe the newer version can connect to the app, but ours could not. Tekno produces kitties and puppies. We do not have the puppy. We only got the kitty one, and as you may guess from this post we will not be getting another one. One reason is that we could not get all the features to work, and the other reason is that my daughter forgets quickly about it. 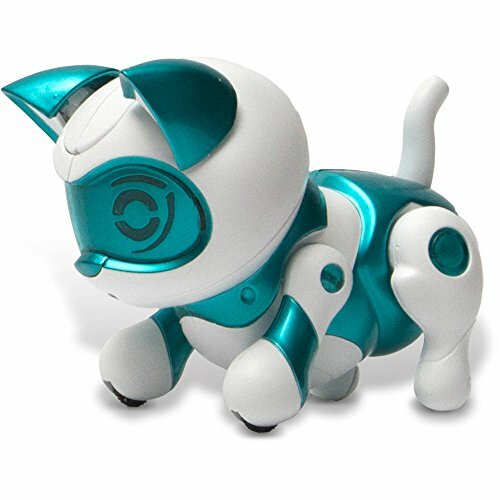 How does this Electronic Toy cat Look? This Electronic Toy cat comes in a super cute box. The box has some drawings behind, and it can be used as the kitty home. You can see the pictures in the box. You can get others with different pictures. I quite like it. And I had not noticed it till someone pointed it out to me. Our Kitty is white and pink, but I also saw it in white and teal. or white and blue. 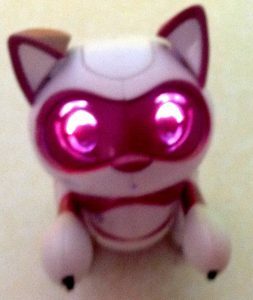 The face of this Electronic Toy cat is completely pink on the eyes, and her eyes can light up when singing or meowing. The ears are also pink on the outside. 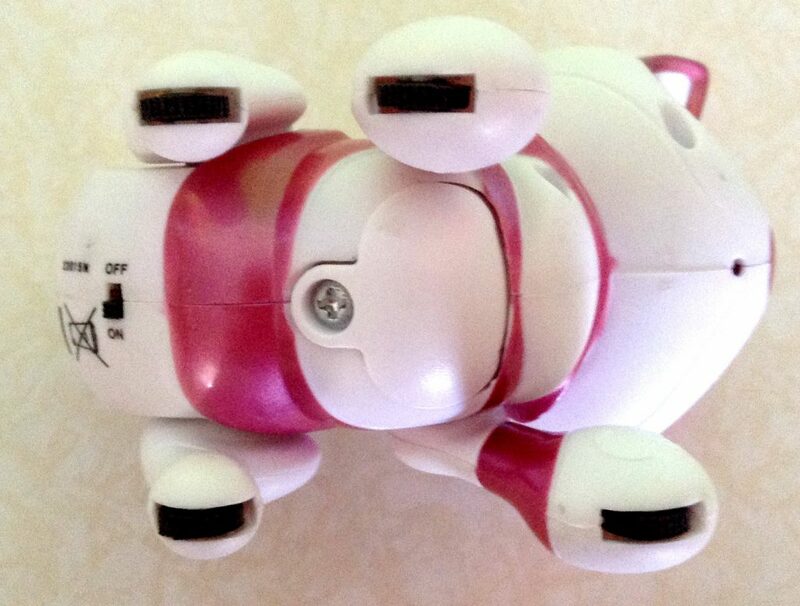 The body is pink on top with a white tummy and the legs are white and pink. It comes with an on and off switch at the bottom of the kitty. . Remember to switch it off so it does not waste batteries, but also if you leave it on all day , it would drive you mad. What can the Tekno Newborn Kitty do? The legs have wheels, though I think only the front legs have wheels in the newer models. 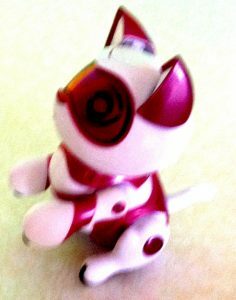 Ensure that children do not submerge the Tekno Newborn Kitty n water, because that will be the end of the toy. What Does this Electronic Kitty Toy do? 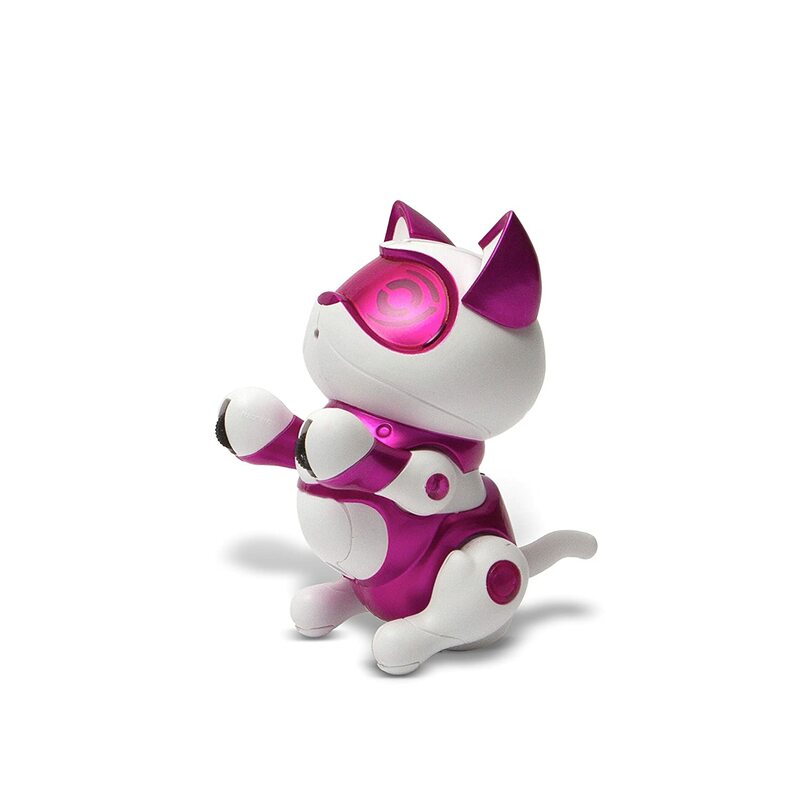 This electronic cat toy, can sing, sit, beg, walk and then she can respond to your request via the app, or via clapping. The kitty takes 2xAAA batteries which are not included. The Kitty is made out of a hard plastic material, but you need to be careful not to damage it. The ears can come off, so be careful, though if they do not break you can put them back again. Some people had problems with legs coming, off, but we have not experienced that. To walk you need to move the Kitty’s front leg all the way to the front and then speak to her. You can say “Walk” Or “Stop”. These are the words that my daughter experimented with, but I believe you can use any words. The kitty gets activated by the voice and not the words. But even if you do not talk after a while she will walk a bit. The kitty will also respond at the clapping of your hands. While she walks she still sings her song,. The Newborn Kitty can also sit. You need to push the front legs back , and then she will sit and sing or meow. You can also talk to her, or clap and she will respond. Now if you put her front legs not so back and not so forward, then she will beg. It is actually quite cute to see her begging. at least my daughter enjoys that. The electronic kitty toy can also sing. 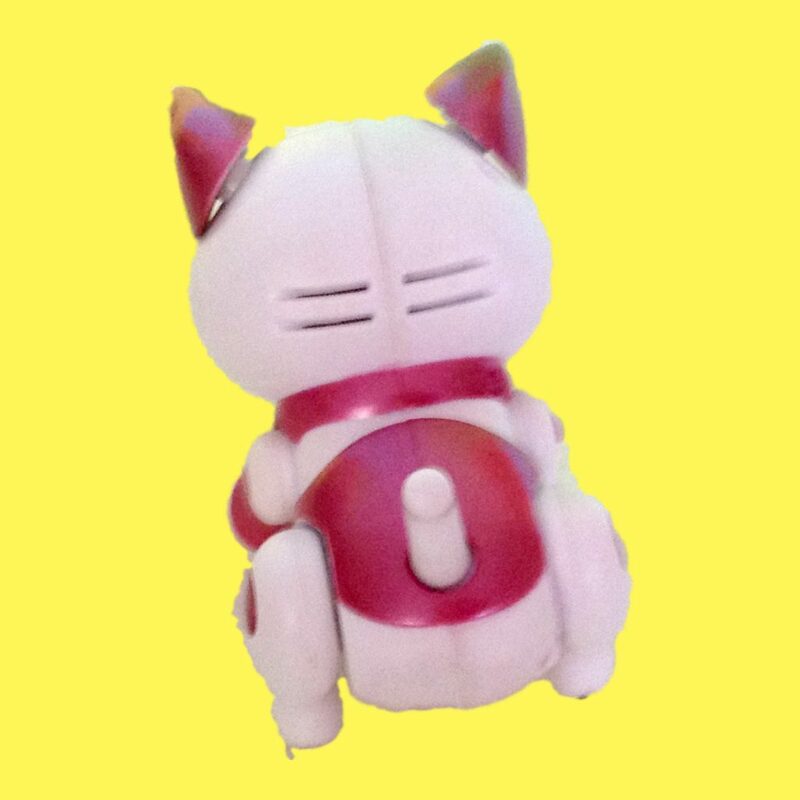 If you move the front legs all the way to the front and then you press and hold the button on top of her head till you here a “Do” sound, then the Tekno Newborn kitty will sing you a song, and can obey your orders as well. The Kitty’s eyes light up when meowing or singing. The expressions are supposed to changed and you could control it with the app, but we could not work that out with our version. But we saw the eyes lighting up. The orders are giving by talking or clapping. . But the spoken orders are very vague. You can say anything and she will start walking or singing. It is not that she follows specific commands. As soon as you speak she will move or sing. I wish they had put some specific commands, like sing, walk , stop, turn. But I suppose that is more advanced electronics. 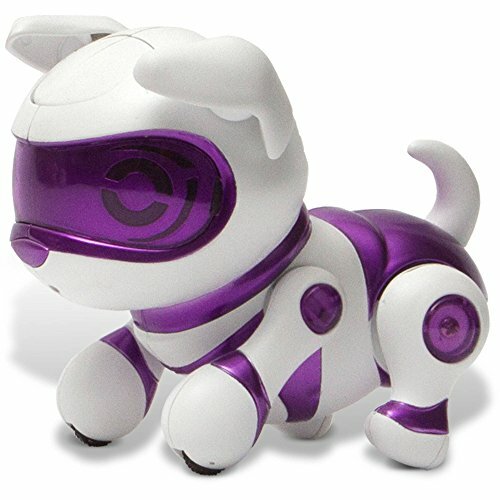 I am sure there is other electronic pets that can do that. Does an App help with these Interactive Kitty Toys? There is an app that you can download on your phone or table, and supposedly the Kitty will interact with the app. The app lets you upload new songs that the kitty will sing, or record your own music on the piano. You can also create an animation where you can select the music, emotions, actions, , and sounds that the kitty will do. , and then you can control the kitty movement or meowing. Everything sounds great, but we could actually not make the app work. 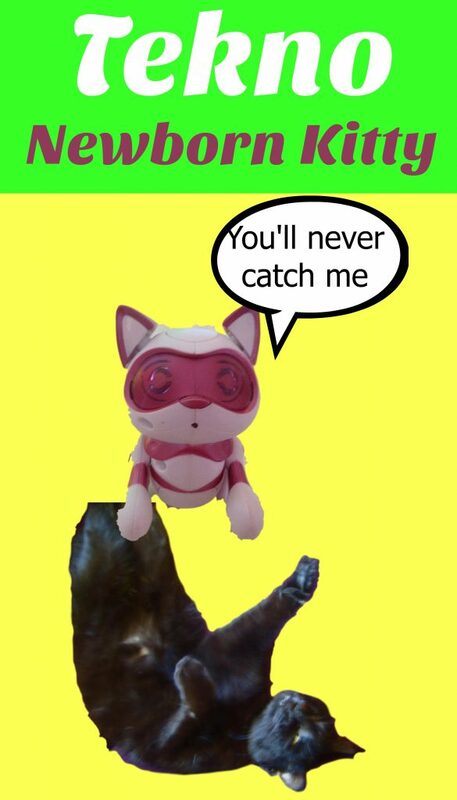 I can create what they tell me, but I battled to get the app to interact with the kitty. So in reality it does not work. I have been told that the app only applies to the bigger pets, but I am not sure. I actually contacted the manufacturer to find out how it works and I am hoping to hear form them. I will update this if that is the case. 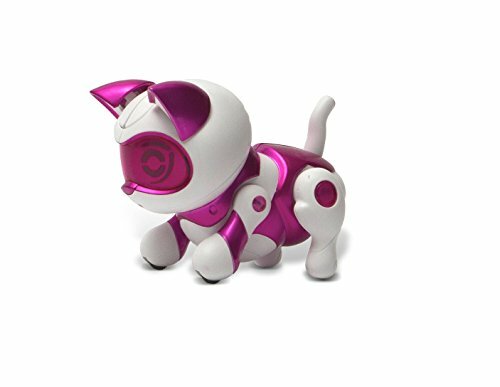 In the meantime you can get any of the Techno electronic kitty toy or the Tekno newborn puppy or the Tekno dog , or Tekno cat. or maybe you want to go for a totally different electronic pet toy, and go for the hatching eggs toys, like the Hatchimal. You can watch a video of my daughter explaining how this little electronic kitty wors.